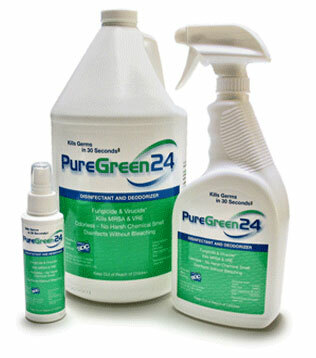 PureGreen24 is an great green disinfectant, antibacterial, antiviral and antifungal for hard surfaces. It is fully registered with the EPA and has the lowest toxicity rating of (IV) so it is completely safe to use. It is non-flammable and non-corrosive. PureGreen24 has 24 hour residual effectiveness which means surfaces are protected for hours after being disinfected. Puregreen24’s patented technology is based upon SDC which is a combination of citric acid and water soluble silver ions which occur naturally in the environment. PureGreen24 works very quickly and in many cases is faster than most leading “non-green” brands. PureGreen24 does not stain clothing or damage fabrics. PureGreen24 is non-irritating to skin and has no odor or any irritating fumes which is critical for those who have chemical sensitivities. PureGreen24 is a broad spectrum disinfectant which kills 100% of:MRSA, Staph, SARS, Bird Flu, Norovirus, Herpes, E coli, Athlete Foot Fungus, Salmonella, HIV and other organisms. What else is great about this green disinfectant is that Pure Green, LLC, (the manufacturer of PureGreen 24) donates 10% of its profits back to charities in support of children’s health, cancer research and animal protection. PureGreen24 is ideal for use in the home, hospitals, nursing homes, schools office building, locker rooms, daycare facilities, etc. PureGreen 24 meets the recommendations by the United States Centers for Disease Control (CDC) for infection control for care of patients with confirmed or suspected Swine Influenza A (H1N1) virus in both home and healthcare settings.